Because a lot of people have been asking me about it, i wanted to tell you a bit more about the process of making the visualizations for the 80m2 project. The whole basis of this scene, walls, floors, ceiling, were made on a basis of a CAD file. Wooden floor was made thanks to the great Floor Generator script by CG-Source. As for the furniture models some were made by me, some are free models downloaded from the web, but i think that a big thanks here should go to Viz-People for their free Moroso Smock chair. 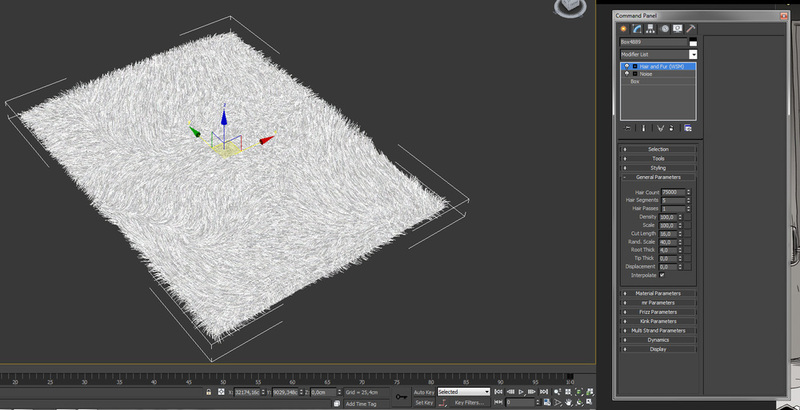 The carpet in the livingroom was created using 3ds max built-in Hair&Fur modifier. After applying the modifiar to a box with chamfered top edges and Noise modifier, Hair&Fur needed a bit of styling, and i think that it is the best part about h&f, so i highly encourage you to use it. Below you can see a couple of views showing how the light was set up. My render setup is pretty basic for all scenes i create. I always use the linear workflow (LWF) and Irradiance map + Light cache for rendering. I think that that’s all for now. If you have any questions please do not hasitate to comment and ask, and i will try to help, if possible. I hope that this will be useful so have fun and take care!